NOTE: This article is not paid content. No commercial incentive or promise of remuneration has been paid, promised, or discussed. However, the author is biased because he likes uncontaminated wine. And he loves dogs and has a Chocolate Labrador Retriever with a spooky sense of smell. 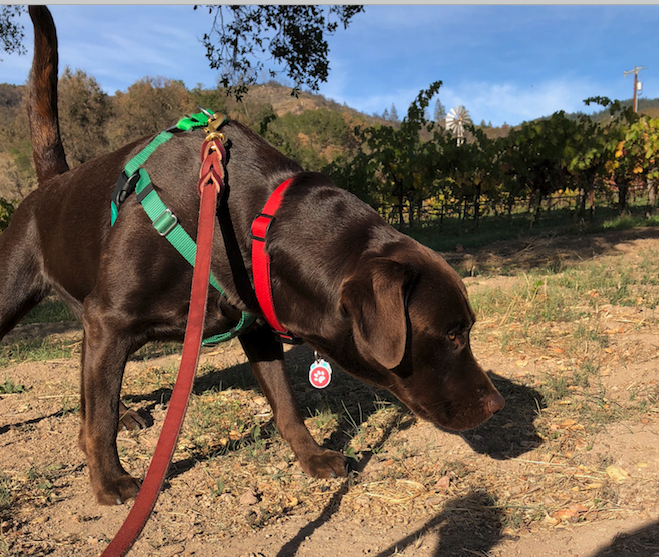 While not yet common, a few wineries around the world have realized that dogs’ keen sense of smell could be used to detect TCA (2,4,6-trichloranisole) — commonly associated with “corked” wine. Cork, however, sometimes gets a bad rap because it is far from the only source of TCA: it’s been found in drinking water, soft drinks, plastics liners and hosres, silicon bungs, fining agents, and shipping materials. and oak wood used in barrel staves. It’s no wonder that, with so many non-cork potential sources, that some wines end up “corked” despite the best closure technologies. Into the TCA mess steps one of the oldest and most reliable odor detection devices: dogs. 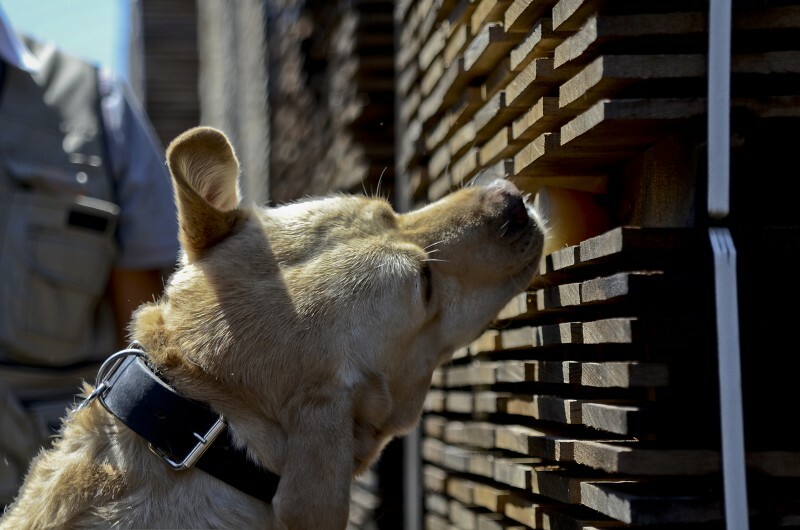 TN Coopers, a Chilean-based international company has been using specially trained canines for several years to root out TCA and other wine-ruining chemicals that may have contaminated shipments of oak stave blanks from around the world. They dubbed their initiative, thew Natinga Project. Michael Peters, who runs the TN Coopers office in Sonoma, said the company is bringing some of their Natinga Project dogs to an on-site winery tour in the United States. 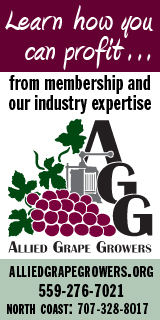 “I believe we are the first to use dogs… so simple” Peters told Wine Industry Insight. After 2 years of training, we presented our experts, Ambrosia and Odysé, two friendly professional Labrador retrievers (former drug sniffing dogs) to detect TCA and TBA. Over the years, we now have a team of dogs introducing: Moro, Zamba and Mamba. Our goal is to provide innovative support for the winemaking industry by developing a permanent surveillance program within our barrel and alternatives manufacturing process and also to extend this unique service for our clients in Chile at their winemaking facility. Our goal is to train dogs at all of our offices and to bring this service internationally in Italy, South Africa, and here in North America. They’re used for drug sniffing, fugitive tracking, and numerous other tasks because of their abilities to small odors in concentrations that are 10,000 to 100,000 times less concentrated than humans. And that’s amazing because we can sense odors present at one part in a trillion. One part per trillion is about the same concentration as putting 1/2 a grain of ordinary kitchen salt in an olympic-sized swimming pool. Interestingly, one part per trillion are of the same relatively infinitesimal concentrations of estrogen, insulin, testosterone, thyroid, human growth and other hormones (or EDCs) that are effective in regulating (or disrupting) the operation of our bodies. The concept might be easier to grasp if we consider your own experience with these levels. If you have ever smelled the faint odor of natural gas, you’ve detected something in the parts per billion range. Actually, because natural gas is odorless, what your nose can smell at the ppb range the stink of mercaptan, which is added to natural gas as a safety feature. And parts per trillion? You can detect TCA in wine even if it is present in a concentration of 1 ppt. But only close up … say, 2 inches. By contrast, if a dog is 10,000 times better than us, that means they will be able to detect TCA many yards away. This phenomenon, up until recently, was only associated to the cork, which supposedly acted as a transmitter to the wine of the so called chloroanisoles, especially TCA, a compound capable of passing into the wine; an unpleasant and penetrating fungal aroma in very low concentrations. Currently however, many more molecules which transmit unpleasant aromas to wines have been identified. Among these, chloroanisoles and bromoanisoles, and especially the 2,4,6- trichloroanisol (TCA) and 2,4,6-tribromoanisal (TBA) constitute the most frequently identified compounds in the wines considered as “moldy” or “corked” during wine tastings. The physiochemical characteristics of these contaminants explain why, despite their elevated boiling points, the halophenols and haloanisoles are easily found in farm atmospheres, which contain more than a few emission sources. The problem’s true origin is not the presence of fungi growing on the cork or wood, but rather the elevated environmental contamination of chlorophenols and bromophenols which are transformed by these microorganisms into the corresponding anisoles. For this reason, it is very important to perform preventative tasks to avoid contamination by these pesticides. The wine’s moldy or musty flavor and/or aroma, in part, is a consequence of the presence in the environment (whether in air or water) and in supplies (paints, varnishes, filtered earth, wood, among others) of microorganisms (especially filamentous fungi), which upon entering in contact with a series of industrially used pesticides, develop a defense reaction which can produce haloanisoles. 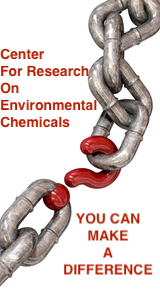 These pesticides are chlorophenols, fluorophenols, iodine phenols and bromophenols. Finnegan, the author’s dog, hot on the trail of something at Bartholomew Park, Sonoma.